William Floyd High School music teachers holding the “Long Island Music Hall of Fame” banner. 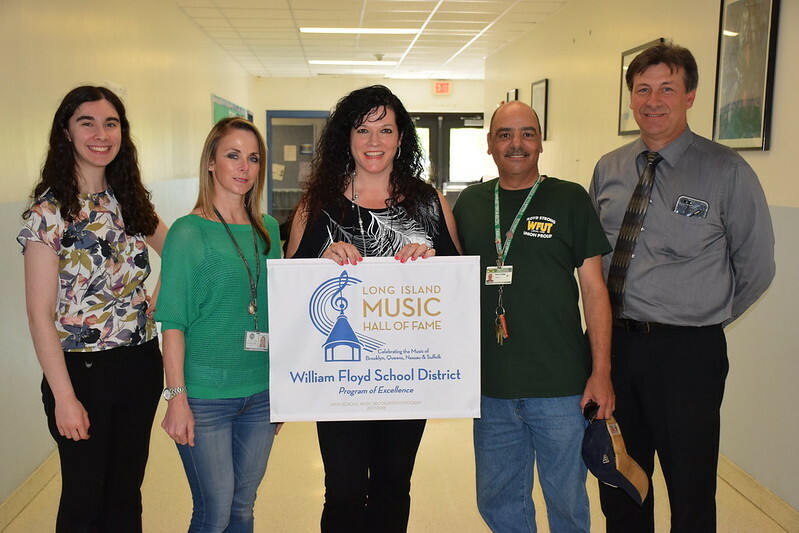 The William Floyd School District Music Department has been selected as a recipient of the Long Island Music Hall of Fame (LIMHoF) 2018 Gold Recognition Award for its rich history of excellence in music education, an awards program which is designed to identify Long Island high school music programs that are creating notable music experiences for their students and are incorporating the national and New York State standards for the arts in creative and meaningful ways. William Floyd was recognized along with five other schools and was the only Gold Recognition Award recipient to receive districtwide honors. The William Floyd Music Department has received many accolades over the years including the New York State School Music Association (NYSSMA) “Program of Excellence” award; the “Outstanding Music Program” and “Model Music Education” program designations by the National Association for Music Education (NAfME) formerly Music Educators National Conference (MENC); as well as a four-time recipient (2006, 2007, 2017 and 2018) of the “Best Communities for Music Education” designation by the National Association of Music Merchants (NAMM) Foundation. In addition to William Floyd, the other schools being honored with Gold Recognition Awards are Great Neck North High School, Great Neck South High School, Manhasset High School, Southampton High School and Brentwood High School. Over the years, Long Island has produced some of the most incredible and accomplished musicians who have influenced generations of music lovers. In 2004, a group of those music lovers, as well as music educators, and industry professionals, banded together to found the Long Island Music Hall of Fame in order to recognize, honor, and preserve Long Island’s longstanding and diverse music heritage. The LIMHoF welcomes the involvement of community volunteers as well as business and corporate leaders. It is their hope that the community will join them in celebrating not only Long Island’s rich music history but also in celebrating the music in all of us. Please see the album below with William Floyd’s music teachers pictured from each building!